Approximately 4 million properties in the UK are at risk from surface-water flooding which occurs when heavy rainfall overwhelms the drainage capacity of the local area. Several national weather centres have been developing new numerical forecasting systems to improve prediction of such events. Weather forecasts are based on the output from a numerical computer model. Such models are built from a mathematical description of physical laws that govern the behaviour of the atmosphere and evolve an estimate of the current state of the system forward in time. The estimate of the current state of the system may be obtained by a sophisticated mathematical blending of information from previous forecasts with recent observations in a process known as data assimilation. 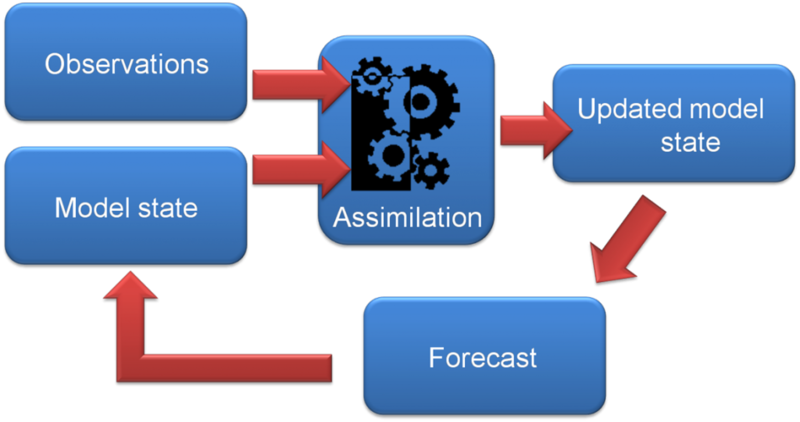 In data assimilation we compare model forecast predictions and observations and adjust the model state so that it is closer to the observations, bearing in mind the uncertainty in the observations. However, the quantities predicted by the model are not usually the same as those being observed by the operational observation network. For example, in weather forecasting the model may predict wind, temperature, pressure and humidity. A weather radar on the other hand sends out pulses of electromagnetic waves and measures the intensity of the returned signal as the waves bounce off raindrops in the atmosphere. Thus we require a mathematical model that describes the physical relationship between the predicted quantities and the observations. In data assimilation, this mathematical model is often termed the observation operator. When we compare the model predictions to the observations using the observation operator we are typically left with a residual known as the observation uncertainty. This image shows a measure of observation uncertainty for observations from the SEVIRI instrument used in numerical weather prediction over the UK. SEVIRI is a satellite-borne instrument measuring quantities sensitive to surface temperature (channels 7, 9 and 10) and upper level water vapour (channels 5 and 6) – see Figure 2. Channels 7, 9 and 10 are not used over land (the white areas in the picture) and the high uncertainty values shown around the coastline are due to a problem in the operational system quality control. Properly accounting for observation uncertainty in data assimilation is an important research topic. Our research has already led to improvements in operational weather forecast skill for global forecasting. Experiments are currently underway to find out if further improvements can be made for local forecasting of intense rainfall events. This entry was posted in data assimilation, earth observation, Numerical modelling, Remote sensing, Weather, Weather forecasting. Bookmark the permalink.